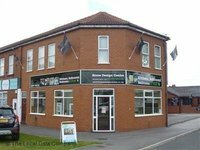 Welcome to Home Design Centre, a bathroom and kitchen showroom based in Castleford. We have been supplying and installing fitted kitchens, fitted wardrobes and new bathrooms for customers locally, in Wakefield and across the West Yorkshire area since 1992. Our showroom provides design, supply and installation services for retail and domestic customers. Striped kitchen and installed a new one. Very happy with results and no issues whatsoever. Michael was very pleasant, helpful and easy to get hold of. I would happily recommend the business to others. Fitted kitchen and partial bathroom and very happy with the job. They came recommended by a friend and I was very happy we chose them. The job stuck to quote and was finished on time. I would definitely use this company again! They designed and built our dining room and kitchen, it was a big complicated refurbishment job. We were very happy with all work done, they did a very good job. Good communication, very pleased, quick to come and remedy any issues. They were nice friendly workers and the whole project was well managed and to a top notch quality standard.